Showing results for tags 'morathi'. Hi everybody! I have a question about THE central piece in every DoK army around: Can i choose to transform Morathi even at 0 wounds allocated(without any further check or roll), or i need to roll on her allocated wounds? Thank you very much! Sooo spent practically my entire day today working on Morathi. Building her and then beginning to paint her! She's certainly shaping up nicely looking forward to seeing her when she's done. I'm a bit unsure on the pink scales but well they'll do! Unless I can find a better colour to add my second drybrush coat with. Drybrushing them wasn't too bad and makes it a faster process! Hi TGA Community, I'm new to AoS and am looking to begin with a few friends. I'm looking to start the Daughters of Khaine and the Idoneth Deepkin sometime in the near future (Yeah I'm the elf dude lol). I'm just building a 2000 list to work toward and gradually build, so any input would be appreciated! Sect: Hagg-Nar Battalion: Hagg-Nar Cauldron Guard 1x Slaughter Queen on Cauldron: Command: Devoted Disciples Artefact: Thousand and One Dark Blessings Prayer: Sacrament of Blood 1x Hag Queen on Cauldron: Artefact: Iron Circlet Prayer: Catechism of Murder Battleline: 30x Witch Aelves w/ Paired Knives 10x Witch Aelves w/ Pair Knives 30x Sisters of Slaughter w/ Barbed Whips and Bladed Bucklers Others: 10x Blood Sisters 10x Khinerai Lifetakers 10x Khinerai Lifetakers I think the plan is to surprise the enemy with a more durable build. I have taken two Cauldrons (which might be an over-investment, not sure) to anchor either flank and hopefully effect the center as well. Hagg Nar boosts this effect with +1 to saves. I am not sure about how good the fanatical faith save becomes, does the +1 roll for Blood Shield apply to fanatical faith? The Thousand and One Dark Blessings makes the Slaughter Queen even more of a tank. The Hag Queen can also buff with Catechisms of Murder, which I'm also thinking about taking Crimson Rejuvenation, but I figured that I would want CoM more. 30 Witches and 30 Sisters of Slaughter to charge in and cut through infantry, one in the center, and one nearby on the flank. 10 aelf Witch Squad is meant for rearguard duty and objective guarding. Blood Sisters are meant to anchor and put pressure on a particular flank. The Khinerai are meant to be in reserve from turn one, then come down behind enemy lines and clean up any vulnerable ranged units. When they complete their task, the Khinerai will charge into any combats or weakened units (hopefully from the rear) and help finish them off. That's how I'm planning it for the most part! Would appreciate any advice! She was done mainly by airbrushing. Her skin is Vallejo Model Air Skin Tone over Vallejo Game Air Barbarian flesh, washed with Reikland Fleshshade, then a thinned burst of VMA Skin tone followed by a thinned (and targtted) wash of Druchii violet. Her golden pieces are are Vallejo Metalics Copper and Gold. Based with Copper, highlighted with a 50:50 mix, then a final edge highlight (with airbrush) of Gold. These paints are an absolute dream. Stop using GW metalics and get these. Her boots and gloves are a mix of Vallejo model wash grey, nuln oil, abaddon black and incubi darkness. Her hair is the same mix but with more green (so that when she becomes the Shadow Queen the hair and snakes resemble one another). The fabric is Screamer Pink on the outside and Khorne Red on the inside. Both washed with Nuln Oil, Druchii Violet and highlighted with the original colour and edhge highlighted with Wazzdaka red and Slannesh Grey respectively. The Slaanesh grey was the tough bit. It needed significant clean-up and a targetted wash. I learned my lesson here - use a bigger brush! Her hair and cloth were the only bits not airbrush based and honestly I regret not doing that. It was becuase messed up the order in which I painted by starting with the metalics and then the skin - which is how I would hand brush (inside-out and all that) - but I should Have started with hair and cloth, then the metalics, then the skin. 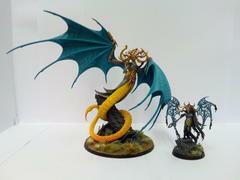 Here's some pictures of Morathi. This was a nice model to work with for teh most part. Her head was difficult though and I messed-up her eye make-up a bit - you can really only see the errors on camera though. Her colour scheme is an evolution of the Witch Aelves's on which I've made some further progress: I'm still undecided as regards which Temple I'll go with but the scheme is versatile enough to fit in with either the Khailebron or Draichi Ganeth temples.